Leaktech are extremely experienced is discovering underground Cable And Pipe Locations in Brisbane and the Sunshine Coast. Our highly trained staff use ground penetrating radar and other detection equipment o locate pipes and cables underneath the ground. Cutting through gas, electricity, telecom, water or sewerage lines endangers lives and the disruption to any of these essential services is expensive. Whether a commercial project or residential, such as a new driveway or pool installation or renovating your backyard, call Leaktech Australia for the most efficient and cost effective method for your project. 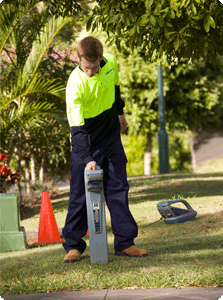 Our Telstra Accredited technicians utilise world’s best technology to locate and identify your underground services. Our technicians carry additional accreditation to locate Telstra fibre optic cable. Leaktech Australia has full insurance cover – Professional indemnity, Public liability and Workcover. Our accredited plant locators (APLs) technicians interpret and verify plans supplied by underground infrastructure owners, identify cable locations, Telstra and other major underground plant. We can also organise the Dial Before You Dig plans – free. After underground services have been located, it is critically important for you to pot-hole, using a hand-shovel, to establish the exact location of services, before mechanical excavation. For more information, please call Leaktech on 1300 0 532 57 or request a booking using the button below. Leaktech specialises in water and gas leak detection, and underground service location. Our highly skilled technicians combine our Leaktech trade secrets with a range of technologies such as: thermal imaging, acoustic detection, data logging (pressure and acoustic), correlation and our unique tracer gas technology. Copyright 2019 Leaktech Australia (Sunshine Coast and Brisbane). All Rights Reserved.